This Cocoa set has a cocoa pot and six small cups and saucers. The bottom is marked “CFH/COM”, and is supposedly from the period of 1882-1891 by the De Havillands. It is stamped Limoges. My grandmother passed down six different Limoges cocoa sets and I now own them all. I also have a sugar, creamer and teapot given to her in 1939 when the Royal Sovereign visited the U.S.A. for the first time (on the bottom it states no.5 of 3,000). 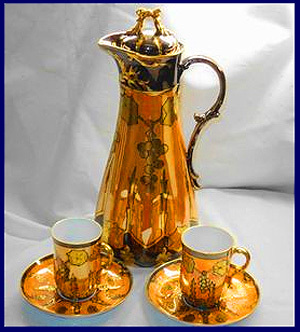 I can send pictures of either the Limoges cocoa set or the other set if they sound interesting but I need help using this computer as I am new to all this. My grandmother was born in England and her maiden name was Test. I am told my family is somehow connected to the River Test, in Hampshire (where Princess Di honeymooned). That is the reason she was so interested in English and Limoges porcelain. Do you recognize this Limoges pattern, Christine.